Before any hockey season, there are certain games that fans circle on the schedule. Every team has rivals, and often, a team’s season is defined by how they perform against these rivals, particularly in their own division. In Rivalry Recap, we’ll examine how the St. Louis Blues performed against their biggest divisional foes in the 2017-18 season, starting with the Chicago Blackhawks. Though the Blues had a winning record against the Hawks in 2017-18, it was arguably one critical loss that ultimately cost them a playoff berth. As Blues fans well know, October was the apex of the team’s season. They went 10-2-1 in the first month of the season, and one of those ten victims was their biggest rival, the Blackhawks. The game was a Jaden Schwartz showcase. He recorded his third career hat trick to propel the Blues’ offense. In the fifth minute, he opened the scoring with a beautiful forehand-backhand play on a feed by Vladimir Tarasenko. He netted one more in each succeeding period, including an empty-net goal in the final minute, to confirm his hat trick. He even scored on a cross-ice assist from goaltender Jake Allen. Schwartz’s strong night was ultimately enough to give the Blues a victory, but there were worrisome moments as well. Despite a 4-0 lead in the third period, the Blackhawks, known for their ability to mount late comebacks in little to no time, scored two power play goals two minutes apart. The power plays came after Vladimir Sobotka was called for three penalties simultaneously, a roughing call and a high-sticking double minor. The goals came from Richard Panik and Ryan Hartman, both players who ironically would no longer be on the Blackhawks at the end of the season. Panik’s goal was a slick redirection, while Hartman’s goal was a deflection off his body from the stick of Alex DeBrincat, a player the Blues would become all too familiar with in the coming months. Jake Allen shined in the game, stopping 22 of 24 shots, making several highlight reel saves along the way. The strong performance of Allen and Schwartz was enough to give the Blues the first game of the season series, and, thanks to the NHL’s scheduling, the two teams would not meet again until exactly five months later, by which time the story of both teams’ seasons would be very, very different. When the teams next met five months later, both seasons had turned rather sour. 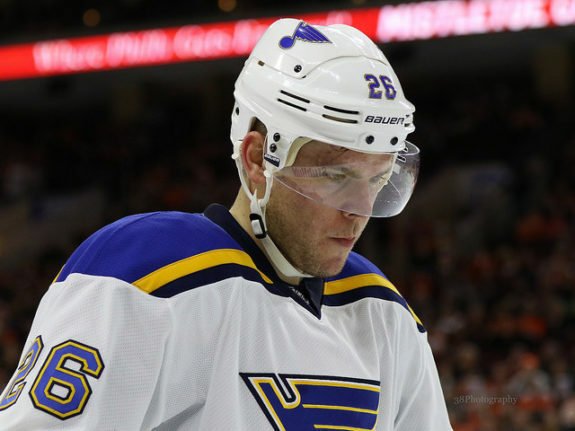 The Blues had a red-hot April, but struggled throughout the rest of the season, and they traded one of their pending free agents, Paul Stastny, at the deadline. They entered the game with a record of 38-28-5. The Blackhawks’ season turned in a direction no one could have expected. Without much warning, the perennial Stanley Cup contenders collapsed, due in no small part to the extended injury absence of their goaltender, Corey Crawford. They entered the game with a shocking 30-34-9 record. Despite the records, both teams fought hard, as one would expect for a rivalry game. Though the Blues ultimately prevailed and grabbed a crucial two points as they fought for a playoff spot, the star of the game was a young Blackhawks’ player. 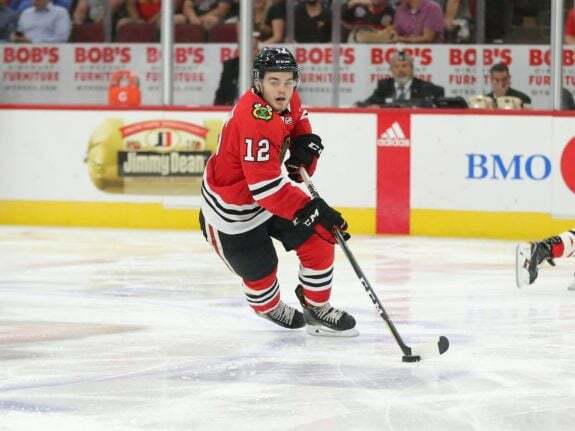 Alex DeBrincat, a rookie, and one of the few bright spots in the Blackhawks’ season, scored his third hat trick of the year, which set a Blackhawks’ franchise record for rookies and also tied him with Tony Granato as the only U.S. born rookies to achieve the feat. Two of DeBrincat’s goals came in the first period. The first was a nice wrist shot over Allen’s blocker side, shot from some distance, while the second was a sloppier goal jammed in over Allen in a tight scrum. The third goal would seemingly be the most momentous, coming in what would turn out to be a flurry of goals late in the third period. DeBrincat buried a one-timer to give the Blackhawks a 4-3 lead, finish his hat trick, and seemingly finish off the Blues. But it would not be so easy for DeBrincat and the Blackhawks. With the goalie pulled, in the final 90 seconds, Blues captain Alex Pietrangelo scored on a one-timer from the point. Then, in the fourth minute of overtime, Patrik Berglund took a hard shot that dribbled through the pads of Blackhawks’ goaltender J.F. Berube. The Blues walked off winners, despite the best efforts of the Blackhawks’ rookie. All told, nine points were tallied in the game by players named Alex (DeBrincat, Pietrangelo, and Steen), but the final goal and assist by Pietrangelo was the difference and carried the Blues to a fairly rare victory in Chicago. The win in Chicago became the second victory of a six-game winning streak that seemed to put the Blues comfortably back in playoff contention. However, a subsequent losing streak meant the Blues entered the final three games of the season needing to conquer their arch-nemeses twice in order to advance. On Apr. 4, the Blackhawks helped to prevent that in dramatic and brutal fashion. In the first half of the game, it seemed as if the Blues would impose their will on their rival. The first goal went to an unlikely scorer – third-pairing defenseman Robert Bortuzzo (assisted by Kyle Brodziak). Bortuzzo received the puck with a lot of space along the wall, took his time, and unloaded a nifty shot that beat Berube to the blocker side. The Blackhawks’ Andreas Martinsen equalized five minutes later, and the score was tied at one at the first intermission. However, the Blues roared out of the locker room with an immediate tally. Brayden Schenn scored 47 seconds in on an assist from Vince Dunn. A few minutes later, Vladimir Tarasenko gave the Blues a 3-1 lead on a breakaway assisted by Schenn. The Blues seemed in control and on their way to another victory over the Blackhawks. But the Blackhawks would slowly carve away at the Blues’ lead. First, Blake Hillman, a rookie who made his NHL debut just a few days earlier, scored a power play goal off an assist by Nick Schmaltz. The game was 3-2 at intermission. Then, 8:30 into the third period, familiar foe Alex DeBrincat scored his 28th goal of the season, unassisted off a giveaway by Blues’ rookie Tage Thompson. The game was an absolute backbreaker for the Blues, who were tied with ten seconds left. Ultimately, had St. Louis escaped the game with even a point, they would have made the playoffs. But the Blackhawks and Keith ensured that would not happen. Still, there remained one game in the season series, and the Blues were determined to take revenge. 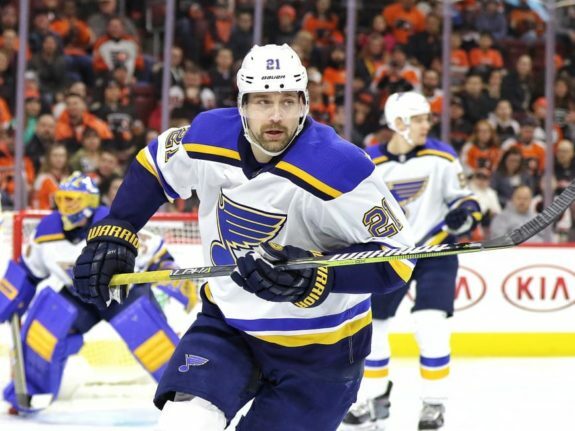 Despite the embarrassing defeat two nights before, the Blues entered their penultimate game of the season needing three points from two games in order to make the playoffs. Therefore, this final game against the Blackhawks was do-or-die, and the Blues delivered a handy victory. Ironically, the season series would be bookended by Blues’ hat tricks. This time, the hero was Patrik Berglund, who delivered a goal in the first and two goals in the third to help his team to a 4-1 victory. On the first, Joel Edmundson took a shot from the point that Berglund deflected in the slot to fool Berube and give the Blues the lead at intermission. Erik Gustafsson equalized eight minutes into the third period, but Berglund responded just 16 seconds later, collecting and depositing a rebound off the stick of Kyle Brodziak. Jaden Schwartz added another tally four minutes later, and Berglund sealed his hat trick with an empty net goal in the closing minutes. The hat trick would be something of a curtain call for Berglund, who was traded in the offseason. Having played his whole career with the Blues, the “big Swede” left the team as the sixth-ranked player in all-time games played with 694 starts, and this final hat trick would be a fond moment for Blues fans to remember him by. 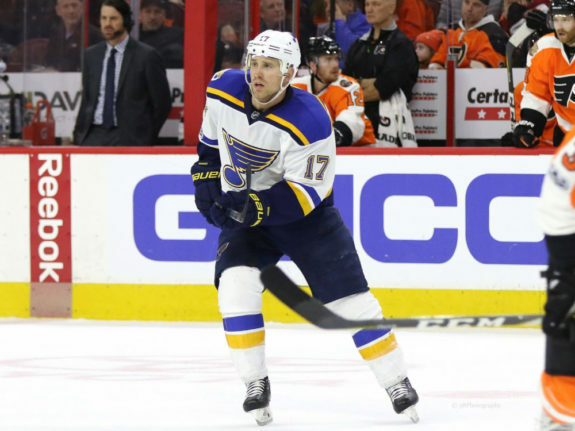 While Berglund’s valiant effort would be enough to give the Blues a victory, the team still fell short of the playoffs by losing their final game to Colorado the next night. Out of context, any Blues fan would be very pleased with a 3-1-0 performance against the Blackhawks in a season; however, the details of the 2017-18 series are a little less flattering than the record indicates. 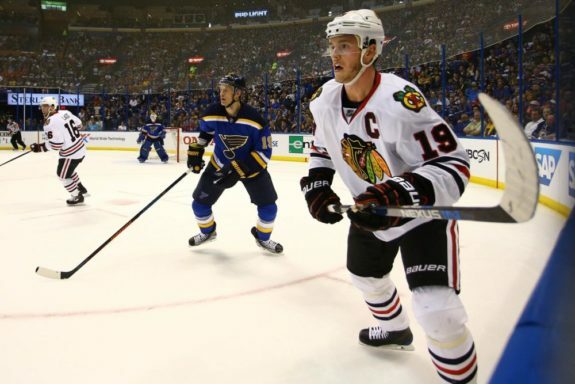 Though the Blues were able to win three games, the Blackhawks scored an enormous moral victory by taking the lead late in the third period of the third game, costing the Blues a valuable point that ultimately cost them a playoff berth. Though the Blues enter 2018-19 with bragging rights, they probably carry with them the bitter sting of that missed point, and the consequences that come with it.